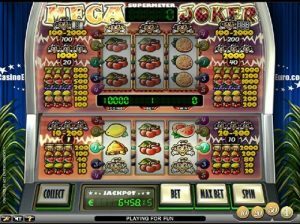 A non traditional online slot game, MegaJoker is no new kid on the block. The game combines the old and the new by using traditional symbols combined with unique symbols such as the joker. This slot game is full of surprises including thousands of dollars in mystery prizes. As the name indicates, the joker is the key to the big money in this game. The joker provides access to the mystery prize. Three jokers in a row is a player’s dream come true and earns a player between 200 and 400 coins, and that is just in regular play. If a player chooses to play in super meter mode, they could win upwards of 2000 coins. This super meter mode is an opt in, optional feature that players can choose to use to enhance or add excitement to their play. This option is played on the top level of reels. The winnings in this mode can be put away to later be withdrawn or replayed for the chance at even bigger prizes. There is the opportunity for an extremely impressive payout here. The coins can be banked at any given time and redeemed for rewards, bonuses, and cash. The most basic play offers betting options betwee n one and ten coins with varying values per coin that start at €0.10 per coin. More coins means more reels, and all it takes is ten coins to activate all five playing reels which grossly increases a player’s chance to win big. The previously mentioned Super Meter Mode can be accessed by matching three symbols on one line. The super meter game requires a larger bet, of 20-40 coins but also offers a much more impressive payout and jackpot. There is a progressive style jackpot up for grabs but this jackpot requires a player to play and bet at maximum value to win it. All it then takes is getting 3 jokers in a row to win this jackpot. If players feel risky, and play in the Super Meter Mode, there are other big prizes to be won. The increased number of coins per play doubles the prize value relative to regular play. This means that there is up to 2000 coins to be won instantly. No Free spins are offered through this game, as it sticks to traditional slots and avoids frills and add ons. The jackpots are big enough to compensate for the lack of bonuses and free spins.